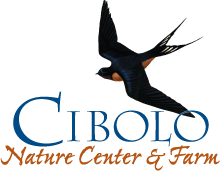 The Wrede Marsh at the Cibolo Nature Center & Farm is primarily composed of switch grass, cypress trees, sedges, and a variety of forbs and aquatic plants. Aquatic insects, including diving beetles and dragonfly larvae, swim amongst the plants alongside the tadpoles and turtles that inhabit the marsh. Take a walk along the boardwalk and you may see a red-winged blackbird nesting in the cypress, green herons wading among the switchgrass, and flocks of cedar waxwings in the trees. Dragonflies and damselflies are often plentiful as they hover among the sedges, including scarlet darter dragonflies, green darners dragonflies, and an impressive number of bluet damselflies. To stimulate biodiversity in the marsh, two weirs* have been installed to vary the water level appropriately throughout the year. Moist soil vegetation are able to establish themselves while the water level is low, while more aquatic plants establish themselves when the water level is high. The outflow from the marsh was recently changed so that the water flows over the nature center’s prairie with the purpose of creating more wetland habitat. Although this flow through the prairie will be dependent on rainfall and may only occur occasionally, some subtle changes to the plant community in the prairie can be expected in years to come. 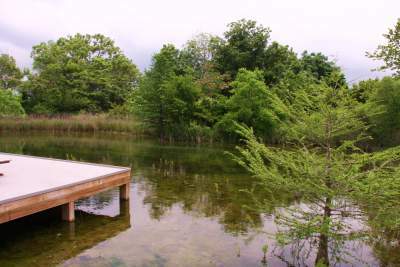 The restored marsh at the Cibolo Nature Center once covered five times as much land as it does now and was nearly entirely lost to development. Thanks to the restoration efforts of the City of Boerne and the Friends of the Cibolo Wilderness, this last remaining portion of the marsh was saved. *A weir is a barrier that adjusts waterflow. Unlike many dams, weirs are constructed in such a way that water will continue to flow over the top of the obstruction. Moving the weir up or down adjusts the level of water that is allowed to flow over the top. Weirs also allow hydrologists to measure water flow.